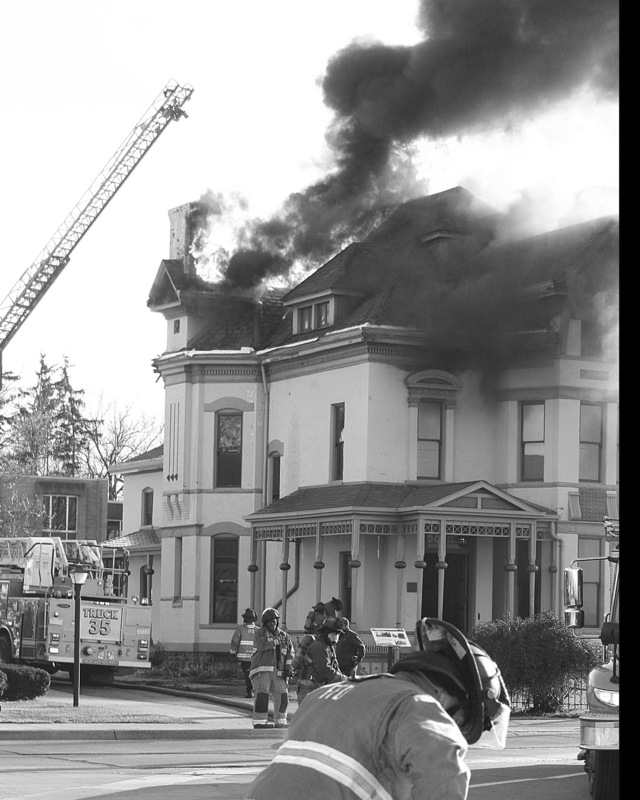 Cleanup crews, conservators, restoration experts and numerous volunteers and supporters of the Whaley Historic House Museum have been busy almost around the clock since the beloved Kearsley Street mansion accidentally caught fire and partially burned Nov. 30. Whaley board member David White, president of the Genesee County Historical Society and until recently director of the Kettering University Archives, said about 40 people came forward immediately to help clean up the mess, including employees from the Sloan Museum, Applewood, Kettering and the UM – Flint. They attempted to rescue hundreds of books and other artifacts from the house’s second and third floors. White said “lots” of books, quilts, textiles were lost, along with a few pieces of furniture that were not from the Whaley family. In the meantime, all December programs have been cancelled. it will take six to eight months for new wallpaper to be made. The Chicago Conservation Center took the Whaley furniture and all artwork to be cleaned,White said.A team from Interstate Restoration, an emergency response and reconstruction service, has been on site since the fire, according to Thomas Henthorn, president of the Whaley House board of trustees. White said within the first 24 to 48 hours the restoration team had removed many priceless artifacts from the house, fixed the furnace and replaced the hot water heater flooded by water. Huge fans and dehumidifiers were working day and night in the hours after the incident, he said. “It is not our wish to have their name soiled by a very unexpected accident,” he said. Now that all the artifacts have been removed, next steps will open walls and ceilings to dry everything out,White said. The house was built in 1885 (or remodeled – accounts differ) for the Robert J. and Mary McFarlan Whaley family, who lived there until Mary’s death in 1925. At the time the three-story structure was built, it joined a row of ornate Victorian homes of prominent Flint families that lined Kearsley Street. All but the Whaley House were eventually demolished – some to make way for the Cultural Center, others for the I-475 freeway. Robert Whaley was president of Citizens Bank from 1881 until he died in 1922. After several decades during which the house was a home for elderly women, in the mid-70s it was taken over by a consortium of seven community agencies who joined together to preserve it and make it available to the public as a museum.